Sunnyside Dru: what is that?! 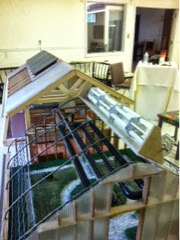 Homer continues to work on the scale model of his house design. A few years ago we picked up windows that were going into the trash, and installed one of them into the wall of our other building. The long, south facing wall. The scale model sits in that window, where the sun shines in on it most days. As we examine, review and discuss what is the best configuration and usage, more ideas perculate. Things are added or removed. Expanded or contracted. Our farm sits on the top of a hill, and the wind blows all the time. Over the years Homer has built various windscoops, windmills, governors for them, dismantling and changing again. We have contemplated the giant windmills, the tiny ones and everything in between. Our hoop house has always been a spot that Homer has wanted to add a wind system around. It certainly gets knocked around in the wind all year. There are days everywhere when the wind is too much and tears things apart, just rips things off of foundations. How can these days be part of the planning, so that the structure stays intact? Because Homer worked so long for organizations building prototypes it is how he thinks. While he looks at what might be available on the marketplace and uses if appropriate, many times he has thought through specific needs and outcomes for small space, small cost infrastructure. New technology exists in many materials, and he works to incorporate in low tech ways. Farming has allowed time and space to contemplate how our home, so wasteful of oil, electric and the like...costing a small fortune to shiver through the entire winter season...can be changed...improved dramatically.